Fashion week was a whirlwind! Branka, one of the founders of LVX, was also in attendance and we were trying to plan a meet up. Unfortunately everyone was so busy it never happened. 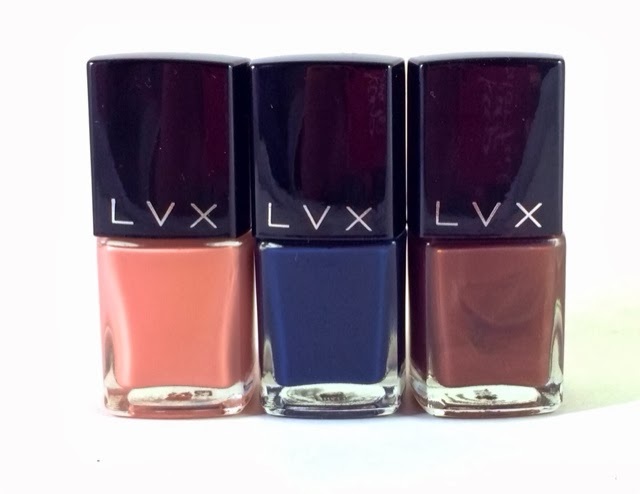 But, the amazing LVX representatives were kind enough to send me a few of their polishes to try out. I have heard of LVX before but never tried it. I knew LVX was a high quality brand but it wasn't available anywhere around me. I was so happy to see Cliquot, Azzurrum and Avalon when I opened up the mail. Cliquot is a neutral peach cream. I used three coats for a nice even coverage. I'm so into nudes right now! It's a perfect finished look that's classy, elongates the fingers and works for any look. Azzurrum is a deep navy blue. This one was a one coater! The formula was great. This shade actually looked almost black in low lighting. Avalon is a rose gold bronze. The shimmer is great! I don't think I've ever seen rose gold in a polish before. This is great for more options and matching to your rose gold accessories. The LVX polishes I tried all had beautiful finishes and are on point, trendy colors. I love their website where they match each shade to runway looks. LVX polishes are 5 free, vegan and cruelty free! Thanks so much for the beauties, Branka. Hopefully we'll get to meet up in September for the next fashion week!